A Republican-led Senate committee on Thursday narrowly approved the nomination of the combative lawyer selected by President Donald Trump to be ambassador to Israel, brushing aside concerns that David Friedman lacked the temperament for such a critical diplomatic post. Members of the Senate Foreign Relations Committee voted largely along party lines, 12-9, to recommend that the full Senate consider Friedman’s nomination. Sen. Bob Menendez, D-N.J., sided with the committee’s 11 Republicans in favor of Friedman. The committee’s other nine Democrats opposed the choice. Friedman, Trump’s former bankruptcy lawyer, tried to use his confirmation hearing a month ago to repair the damage from his past verbal attacks on political opponents. He assured senators that he regretted using inflammatory language and promised to be “respectful and measured” if confirmed. Republicans said Friedman’s atonement satisfied them. But Democrats argued the record of divisive statements cannot be erased and will compromise Friedman’s effectiveness as Trump’s envoy to Israel. Sen. Tim Kaine, D-Va., said Friedman’s contentious history is regrettable because he has such a deep knowledge of Israel and the Middle East. Kaine, echoing the sentiment of other Democrats, said he couldn’t support Friedman because of the nominee’s “penchant” for over-the-top and even false statements. “While it is clear that David Friedman is committed to the U.S.-Israel relationship, his history of inflammatory rhetoric is poorly matched for this role,” Kaine said. Five former U.S. ambassadors to Israel, who served Democratic and Republican presidents, called Friedman unfit for the post in a February letter to members of the committee. The son of an Orthodox rabbi, Friedman has been a fervent supporter of Israeli settlements and a staunch defender of Israel’s government. He also runs a nonprofit that raises millions of dollars for Beit El, a settlement in the West Bank. 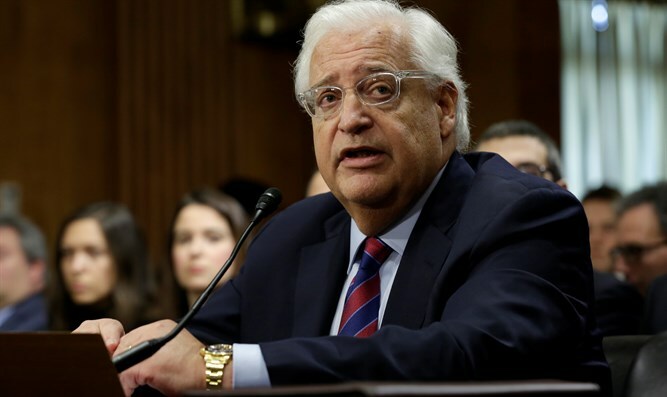 The Yesha Council, an umbrella group representing Israel’s more than 120 West Bank settlements, congratulated Friedman on securing the committee’s approval. “Friedman is a true friend of Israel that has a deep understanding of the reality on the ground and he will be a great asset to Israeli-American relations,” said Oded Revivi, the council’s chief foreign envoy.